I don't usually review sequels, but I love Ursula Vernon so much and her Dragonbreath books are always a funny read. It's a lovely thing to be tired and glum and have a new, hilarious adventure. In this adventure, it's Wendell who's in grave danger. It's not bad enough that his mom has an unhealthy obsession with health food, that Wendell is constantly worried about school (even though he is one of the smartest students). Now he's having nightmares about it all! Wendell and Danny will have to travel back to mythical Japan to enlist the aid of Great-Grandfather Dragonbreath and Suzi, reincarnated ninja queen. Luckily, Great-Grandfather has a portal to the dream world in his refrigerator and Danny is enthusiastically ready to travel into Wendell's dreams and track down the nightmares, not to mention the even more dangerous Dream Wasp. I love the way Ursula Vernon can be so dang funny while still making her characters act exactly as real kids (or reptiles) would. Danny's gung-ho enthusiasm and Suzi's second thoughts, not to mention Wendell's resigned attitude (except for when he finds out about the Dream Wasp eggs and faints) all keep the characters recognizable, even as they adjust to new situations and characters. Verdict: These aren't educational (despite the publisher putting out a teacher's guide) they're just fun! The perfect thing to hand to a reluctant reader, enthusiastic reader, or anyone having a bad day. It is imperative that you have the ENTIRE series. I have just decided I cannot, personally, live without them any longer and ordered the rest of the volumes I am missing for my personal collection. I've read some other books from Annick Press that have this mixture of text/history and comic panels. This one is the best of what I've read so far and it's certainly not something I've seen done before. This is a history of bodyguards, from ancient times to the present day. 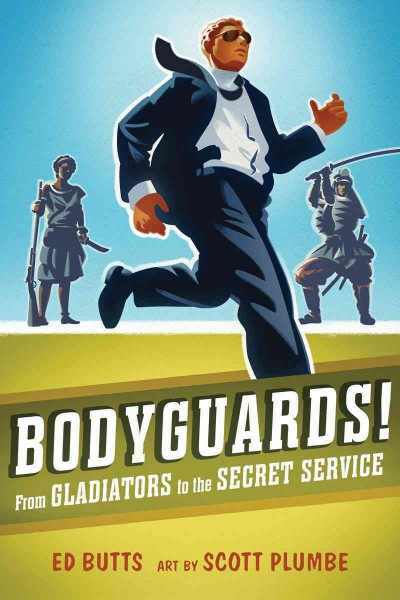 Chapters include a mixture of historical context, descriptions of what bodyguards do, and individual stories of people throughout history. Some of the stories include the Spartans, outlaws of the Wild West, and stories about bodyguards protecting presidents and celebrities. The current cases, while they include some famous stories especially of attacks on presidents etc., also include scenarios that bodyguards use to train or to explain how they protect people. It's pretty clear which are the historical cases and which are the fictional examples. There is also information for kids who are interested in being bodyguards for a career. Back matter includes a glossary, timeline, bibliography, and index. I would have liked some links to the security groups quoted and used as examples, but they are easy to find with a little googling. This book is a really unique blend. Illustrations, comics, text, and factoids all combine to offer an interesting combination of history, fact, and career advice. Most career advice books I've seen focus on weird occupations, white collar jobs, or community service. I'm seeing more titles on military careers, but this combines history and career advice, which is an interesting choice. It is a little heavy on the text at times, and sometimes a little bland, but a good reader won't have a problem. 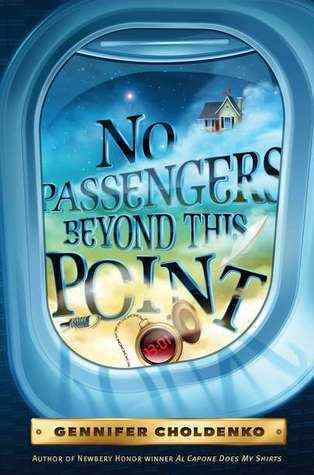 Verdict: This is something a little different that I think a lot of older middle grade readers will enjoy. This week at the library; or, Again with the snow?! Monday felt very productive - lots of programs planned, many small projects completed, and I made significant inroads into the piles of collection development I brought back from ALA Midwinter. It didn't hurt that it rained most of the day and despite there being no school the library was pretty empty. I'm sure the circulation staff wouldn't agree with me though, since just in the evening while I was on the desk I think they gave out at least 5 new library cards! Nice big group at Lego Club - about 50 people and many new attendees. I saw a few mentions of this that looked very cute, but I was disappointed when I picked up the actual book. A fuzzy duckling insists on being friends with a grumpy cat. After trying in vain to explain that not only is she not a duck, she does not want to be friends, the cat finally escapes the importunate duckling, only to realize she really would like to be friends - maybe she'd even like to be a duck! The pictures are cute enough, sort of an airbrushed digital effect. They're not my particular favorite, but I can see lots of kids and parents finding them cute. However, the text was rather bland. It consisted of awkward rhymed dialogue, always the mark of, in my opinion, an inexperienced writer. It takes a really, really good writer to do a rhymed picture book well; it should not be the default for new authors. 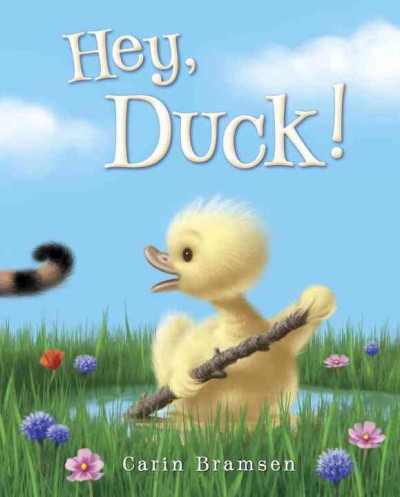 For example, "Hey duck! Why is your tail so long?/Oh, please don't call me duck. It's wrong." It just doesn't work for me. I can't picture reading this aloud in storytime and if a picture book doesn't work in storytime for me, it's probably not going on our shelves. 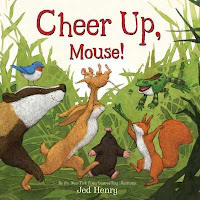 Verdict: This would have been very cute if it had just been simple dialogue, but I'm really picky about rhyming picture books and this one doesn't make the grade for me. If you are less picky, you might want to add it as the pictures are quite cute. 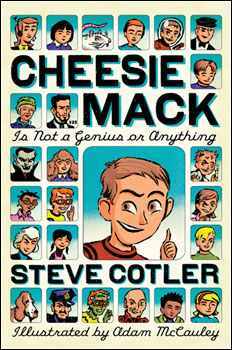 Cheesie Mack is a 5th grader with boundless enthusiasm and interest in the world around him. Right now, the two biggest things on his mind are the mysterious locket and penny his best friend, Georgie, found in his basement and the news that Georgie's dad lost his job so he can't go to camp. Then there's Cheesie's horrible older sister, the fifth grade graduation, the pizza party, the great mouse plot, Cheesie's grumpy and eccentric grandfather...and the list goes on. It all comes together when Cheesie and Georgie discover the penny is extremely valuable and have to decide whether or not to give it back to the rightful owner or use the money to send Georgie to camp. This is a serviceable middle grade humor title, although it's more Melonhead than Wimpy Kid. I didn't see the final art or layout since I read this from a galley. However, a couple things really annoyed me in this story. First, and this is just a personal dislike, the horrible teen older sibling is really overused in my opinion. Of course, I have met lots of kids who don't get along with their siblings, but I have a hard time imagining that parents would just ignore the nasty squabbling these two indulge in, mostly on June's side. Then again, I've seen this in so many books that maybe it's me who has an unrealistic view of family dynamics. The scene where their dad makes June take off her shorts in front of him and Cheesie, even though Cheesie casually assures us that his family doesn't care about stuff like that...it not only sounded fake, it was extremely weird, verging on creepy. Finally, Cheesie's references to his website every couple pages drove me crazy. Seriously, I am not exaggerating. There's three pages of website references at the end. Too much! Verdict: If you have kids who want a younger middle grade title with humor, this will fit the bill. The things that annoyed me are really more adult quibbles and most kids won't care. It's a funny story and the characters are amusing and fairly realistic, even if the plot is a bit far-fetched. It's not particularly unique or anything though. An additional purchase. Thanks to the unseasonably warm weather we've been having, I'm updating our gardening, cooking, and general vegetation materials a little early. This one was listed in a suggestion article in SLJ. It starts with definitions of vegetables and plant terms, including annual, perennial, different types of vegetable from flower bud (cauliflower) to stem (celery) and then devotes separate spreads to the various types of vegetables. Leaf vegetables, bulb, flower bud, root, tuber, stem, fruit vegetables (squash, tomatoes, etc.) and seed. Each of these sections shows pictures of a variety of vegetables, including two small insets, one showing one of the vegetables as a whole plant, the other showing people eating them. There's a separate page on soybeans, then instructions for growing your own vegetable garden and some pages on commercial vegetable farms and where/how people buy vegetables. The final page includes a variety of vegetable facts. This book is for very young listeners, so I didn't feel the lack of back matter was a problem, and it is from 2006 so I'd expect it to be a bit dated, but it's just a little too dated. 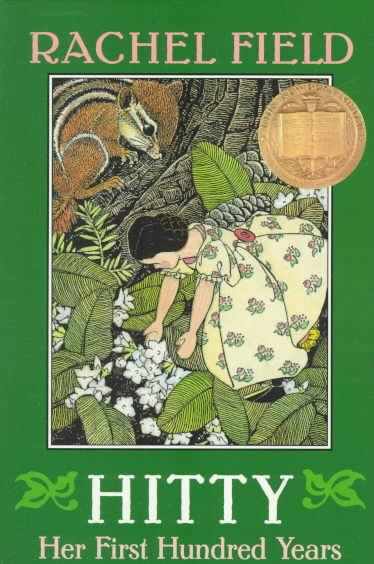 Gibbons' art style really doesn't work for me and her illustrations look messy and hard to define compared to, say, April Pulley Sayre's Rah Rah Radishes . Since a large part of the book is identifying the different types of vegetables, I would have thought a more simplistic, photographic or realistic art style would be appropriate. The people look very 80s somehow. Again, while I get that this book is for very young children, the gardening portion says nothing about composting, good/bad pests, worms, organic gardening (or non-organic, except to say that in big farms "Farmers fertilize the soil" and in the first picture "Fertilizers are added to the soil"). 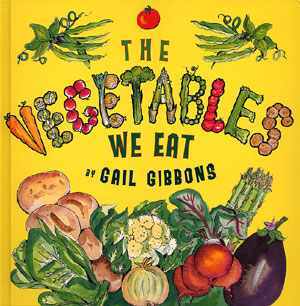 Verdict: I took a look at this one because it was recommended by SLJ, but for my library's needs and my own tastes in nonfiction, I have to say Gail Gibbons' style is dated and I am unlikely to purchase any more of her titles in the near future. Except holiday books, I still get those. This week at the library; or, MORE snow?? We Explore Stories that sing with Smitty and Mary G.
Ok, so last week actually didn't end that badly. On Friday I got to weed the teen graphic novels and nonfiction and I got rid of a LOT of stuff that has been here forever. I'll replace a lot of the icky comics, but I also moved a bunch of stuff to the adult area (yes, it's still circ'ing, but I'm pretty sure it's adults reading it). Monday began with more snow. I'm...getting a little tired of snow. On Tuesday I traveled to the far frontiers of Racine to use their die cuts. Then I spent most of the night in company with ibuprofen. Reminder to self - do not cut with dies for two hours without stopping to stretch your back! Wednesday - all my Preschool Interactive folks came back plus more. Yay! I also participated in a webinar on school and library collaboration. I would like to do more with the schools, but lack of time on both sides is a barrier. I really wish I had time to visit ALL the kindergarten classes, instead of only one at one school. Friday was the last day of our adult services librarian. I am happy that she is moving on to an awesome job that sounds like a perfect fit for her...but oh, the pain she leaves behind! WHY did I say I would do the March/April newsletter? Oh, yeah, because there was NO ONE ELSE. This is what it means to be understaffed - you are poised on the edge and if one person gets sick or leaves, the whole structure crumbles with a resounding crash. In addition to the newsletter I have programs to plan, multiple outreach visits next week, kindergarten registration (still haven't made up a flyer to take to that), two big Dr. Seuss and Clifford programs coming up, I never finished that high lexile list people are waiting for - still in the E's - or updated the school handout on puberty books and that unit is coming up. Then I have the plans to promote the teen collection, displays to update, registration systems to review and make a recommendation, and SUMMER. We Explore was a fun little musical program with two experienced music teachers, one local, one from Chicago. I used money from the VIP Aktion Club ($100) to fund this. I brought over the kindergarten classes from the closest elementary school, who are very handy if I don't think I've got enough attendance to justify a performer. We had about 20 small kids and parents, 80 odd kindergarteners, and 10 parents, teachers, and assorted friends. The kids enjoyed singing songs about crocodiles and doing the Apple Twist! I'm also working on weeding the YA fiction. It's a rather difficult process. On the one hand, our space is limited and circulation is not increasing - to me, this means WEED. On the other hand, what about titles that are integral to the collection but...should I keep Susan Cooper when she hasn't circulated in 3-4 years? What about the entire oevre of Caroline Cooney, most of them haven't gone out for 2 or more years. Do I buy new copies with shinier covers? Do we really need duplicates of all Meg Cabot's books (my director thinks yes, I think no). Should we have a copy of Fahrenheit 451 in the teen collection when it's not circulating and there are other copies in the library? What about Newbery Honors? Do we keep everything with a shiny sticker? What about books I bought 3-4 years ago that...are duds? The less said about Saturday the better. ARGH. I am finally getting down to the last few ARCs from ALA Midwinter...2011, which I have not yet read. I took a stack on the plane with me to ALA Midwinter 2013 and got through about 5 books. I have not read Choldenko's hugely popular Al Capone books. I had not even realized they were that popular until I casually mentioned she had a new one coming out and a hitherto silent and hostile group of 5th graders broke out into spontaneous cheers. However, I understand this book is a radical departure from her previous titles and style. I hope so, because it's not only one I wouldn't recommend, it's one I will anti-recommend. You all like a really strong negative review, right? Settle in, I am going to be negative. Not critical, NEGATIVE. India, Finn, and Mouse know there's something wrong with Mom. India doesn't want to admit anything's wrong and she's wrapped up in hating her family and being a teenager with her best friend Maddy. Finn is desperately worried, but he's pretty much always worried, always trying to be the peacemaker, always trying to measure up to some invisible point. Mouse is a typical eccentric genius child and is satisfied with her invisible friend and her obsession with facts and astronomy. Then Mom tells them their house is gone and they are moving to Colorado. Without her. Tomorrow. They find themselves on a plane and when they get off...they are somewhere else. A strange place where everyone knows their names, their deepest desires, and what matters most to them. Or do they? Finn knows right away that he wants to get back to his own family and place and Mouse quickly agrees. But India thinks she may have finally found a place that really appreciates her, where she can be herself. But who is she really? As is fairly obvious (at least to me) the kids have been in a plane crash and are in a sort of...heaven? Eventually, they make it back and are the only survivors through a series of miracles. Now, Choldenko is a good writer. I kept reading even though I found the story annoying, nonsensical, and increasingly disturbing. If you want to read a stream-of-consciousness fable about life and life after death, go ahead. This is for you. If, however, like most middle grade readers you want a story with interesting events and people you will be disappointed. Despite Choldenko's writing ability, the three children never rose above their stereotyped characters. The platitudes, albeit written in a unique and interesting way, are still platitudes. Most of all the final message in the book is FREAKING DISTURBING. Do not give this book to anyone who has ever lost a family member or close friend, especially if it was a child. In the final epilogue, a folksy local woman (named Mrs. Bean of course) talks to an invisible audience about how she found the children with the help of her dog. She also says that when the kids' mom came "She said she just knows in her gut they's alive. Moms know that kind of thing." (I'm sure every mother who's ever had a lost or missing child would love this miraculous ability to know whether or not they're alive). Then she says "Somethin' on the inside makes one person want to save himself where the next one just gives on up." This is the whole gist of the kids' adventures in the strange beyond-death world. They escape because they want it so badly. So...the other kids on the plane really just wanted to die, or didn't care about their family enough to come back. Your dead child did not love you enough to come back, is basically what this is saying. This is beyond disturbing. In addition to that, the nowhere place the kids go to is pretty obviously meant to be heaven. It's not purgatory, it's not an in-between place, it's the final destination. It's boring, depressing, frightening, and weird. Have your kid read that and expect nightmares about death for the next, oh, three months or so at least. Whatever your beliefs about life (or not) after death, I have trouble seeing this as a way to reassure children about what comes after death, no matter what you believe. Verdict: All I can think of as an excuse for this book is that Choldenko became so caught up in the beauty of her own writing she forgot about plot, character, or what the book was actually saying. Of course, quite a few people have read and liked this and obviously didn't see the very disturbing messages I did. Some reviews call it Kafkaesque. That's ok, different tastes and all, maybe you have nine year olds who really like Kafka. I'm still not buying it or recommending it. Ever. Take a look over at the Cybils website to see the winners! Another exciting year of Cybils has come to an end and Cybils 2012 moves down to the links. Time to start thinking about nominations for next year! I'm especially pleased to announce the winner for my category Non-Fiction Picture Books, Mrs. Harkness and the Panda by Alicia Potter, illustrated by Melissa Sweet. This was a new discovery for me and listening to the round 2 discussion (as an organizer I just listen, I don't talk - a trial indeed for those of you who know me (-:) was fascinating. I'm also excited that Friends with Boys by Faith Erin Hicks won in the teen graphic novel category. I'm a big fan of Hicks and was on the first round judging panel that helped select the finalists. And, finally, Bomb by Steve Sheinkin wins in middle grade and teen nonfiction! Woo! It deserves ALL THE SHINY. 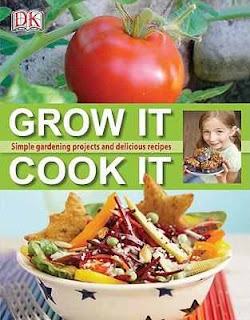 DK has done some fun cooking and gardening books - Ready, Set, Grow, Wildlife Gardening, and Cook it Together. One of the things I like about these books, especially the cooking ones, is that they don't talk down to kids. Grow it, Cook it is no exception. The book is divided into sections by main ingredient. It starts out with general gardening and cooking instructions, as well as an explanation of germination, composting, and cooking terms. Each gardening project is followed by a recipe to use the vegetables and fruit. Projects include growing tomatoes and eggplant, then cooking "tomato and eggplant towers", growing potatoes that can be turned into "mashed potato fishcakes", and carrots for carrot and orange muffins. Like the other books, this is a British import and so there will be a few unfamiliar words and phrases, but nothing that's not easily understandable from the context. There's a nice variety of gardening projects, from things that would be suited to a big garden to stuff that grows in pots. Lots of recycling containers and fun ideas for decorations and ways to make gardening fun, besides the fun of digging in the dirt and growing things. The recipes can sometimes be a little confusing - the lists of ingredients are sometimes laid out in an awkward way - but all the information you need is there and the steps are carefully laid out. These books do more complicated recipes than most kids' cookbooks. They're certainly a far cry from the "things you can make with sugar and peanut butter and maybe an apple that somebody else cut up for you" type of recipes you usually get. Chocolate and mint mousse, green leaf tarts, rainbow salad, there's a really diverse list of things to cook, as well as additional recipes in the back. I have some doubts as to how many kids will really want to eat the recipes, and some of them call for things that you don't typically see on grocery store shelves (puff pastry? I don't recall ever seeing that.) but maybe kids will be interested in trying new things if they're involved from the growing to the cooking. Verdict: The cooking is a little fancy for what I think most of the parents and kids in our small town are willing to try, but the gardening projects are fun and simple and there's enough cooking that is easy and sounds tasty that this book is well worth the money. I strongly recommend adding this to the other DK gardening and cooking books, which you, of course, already own. One of my sort of goals this year is to clean off my tbr shelf and start afresh. I am currently down to only 3 more books from the library to read, about 15 to review....and about 100 galleys and misc. books I've purchased and collected. But today, I am going to FINISH those library books and the review stack! I've been working on this like crazy though and I need a break so...who wants to see my February order list? This isn't exactly a typical list, there are all the award books I didn't have and decided we should have and a lot of replacements. I just finished weeding the juvenile fiction, so that's where most of the replacements will go. I've also been having problems finding really good easy readers so there aren't many of those. I'll also get 6 books from JLG, 4 YA, 1 middle grade, and 1 easy nonfiction in addition to what's on here. Ah, lists. So relaxing. Captain Underpants and the revolting revenge etc. 3 Marvel Zombies books, because some little (insert word of your own choosing here) keeps ripping them off. And somebody stole Hinds' Odyssey AGAIN. What is wrong with people? I'm getting it in paperback this time. This week at the library; or, 2013 was supposed to be an improvement on last year! I am disappointed. Monday: Our adult services librarian is leaving. We are happy for her new, awesome job and very, very sad for ourselves. We are not so crazy as to think we can cover the desk while hunting for a replacement and we are hopefully going to have a temp. I agreed to do the newsletter but it is a ONE-TIME THING. Tuesday: It is looking like a very, very frustrating week. I am not going into details but I am very...frustrated. Wednesday: First middle school madness. I was going to buy extra snacks, then it said it was going to sleet so I didn't, then the weather changed. Then I realized I had forgotten to buy pretzel sticks. However, many kids came, it was lots of fun, I took embarrassing pictures (of the kids) and got hoarse talking over the sound of 30 kids and the Wii. Also, discovered what happens if someone (no, it was not me) puts non-rechargeable batteries into the recharger by mistake. And I only left 20 minutes late! Wednesday evening I took one for the team and watched most of the latest Tinkerbell movie. I do try to at least skim all the feature films I buy for the children's area and preview at least an episode or two of the tv shows. I've never actually made it all the way through one of the Tinkerbell movies before though. URGH, the STEREOTYPES. The animation was pretty, the music was pretty, but every time they introduced a new character...UGH. And do they HAVE to give the fairies pin-up model figures? ANOTHER snow storm on Thursday. Pattie agreed it was best to cancel Family Game Night, but of course we do not ever close for any reason, so I still had Lego Club. About 30 people came, although most left early. On the small side for Lego Club, but pretty good for bad weather. (and we did actually close 30 minutes early). Friday. A beautiful winter wonderland. Luckily, none of the winter wonderland smashed into my car. It's bad enough when Luke's parents get divorced; it's worse when his mom accepts a job in the middle of nowhere and drags him off to Phoenix. She's excited about a brand new start, but Luke just wants to stay at his school, with his friends, and most of all near his dad. 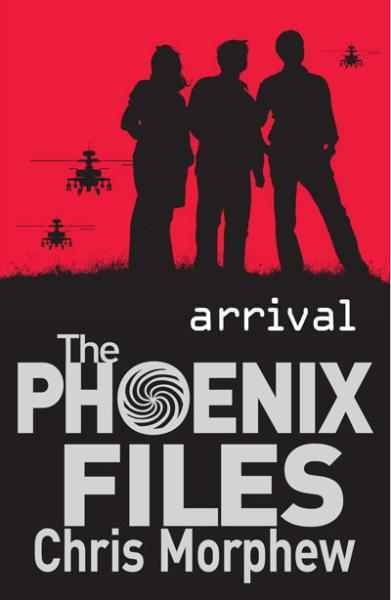 Then they arrive at Phoenix. It's a brand-new town in the outback of Australia and everything is shiny new...except there's no cell phone reception, no internet, and no tv. The school seems just like everything other school; there's a class clown called Peter who offers to show Luke around and a nice enough girl named Jordan, who seems to have some history with Peter. But some things seem a little...off. Why is Luke's the last locker? Why are there no cars? Why, in the middle of nowhere, does a brand-new town have a strange homeless man called Crazy Bill? 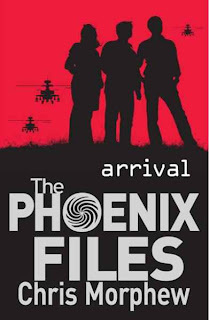 When a mysterious tape, hinting at dangerous conspiracies, is given to the three, they start investigating and turn up what seems to be a conspiracy to end the world and start fresh with the people in the town of Phoenix. They can't trust anyone; not their parents, the other kids who seem to have secrets of their own, or the adults who are in the power of the lethal head of security, Calvin. Even Crazy Bill, who at first seems to be helping them, turns out to be dangerous and his strange powers are frightening. I thought the description of this sounded interesting; I'm always up for a good adventure story, as are my middle school readers, but it turned out to be, well, rather boring. Most of the story is spent hinting at possible conspiracies and even the few exciting things that do happen (Luke's run-in with Crazy Bill, discovering the giant warehouse) are written in a flat "and then this happened" way that makes them, well, boring. The author also interjects language like "crap" but they don't feel like genuine dialogue, more like "this is how teens talk, time to put in another mild swearword". I figured out the hints right away and so there wasn't much suspense left for the rest of the book. There's also no character development to make up for the lack of actual action. We know that there's something going on with Peter and the other kids, that Jordan is a risk-taker, and that Luke misses his dad, but we don't really get a sense of who they are as teens. It's almost 300 pages of build-up and just when it actually starts to get interesting, it ends. Verdict: I think the sequels probably are more interesting and if you stick to it until about 2/3 of the way through it heats up a little, but my readers of end-of-the-world conspiracy adventures are not going to stick with it that long. If they had taken the language out and cut it down a bit it would be a perfectly good choice for older middle grade. An additional purchase if you have kids who don't mind the slow build-up - but if you do decide to buy it, you need to buy the sequels simultaneously to get the whole story. There are three books of a planned six-book series out now. After seeing my frenzied enthusiasm, the rep kindly produced from some magical place an F&G of this title for me and I present it to you in all its glory. 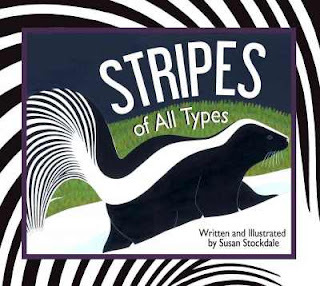 Susan Stockdale has written and illustrated several nonfiction picture books for young children. Our favorites, at my library, are Fabulous Fishes and Bring on the Birds, both rhyming. Stripes follows the style of these two books with rhyming couplets split between pages "Stripes found in water,/sliding through weeds./Drinking from rivers,/and darting through reeds." The book goes on to describe a variety of actions, with one picture for each, until the final couplet which incorporates children, in this case holding kittens. Back matter includes thumbnail illustrations and an identification guide, along with how the featured creature uses its stripes. This book has an additional bonus, a page of close-up stripe illustrations that can be used as a guessing game. Stockdale's swathes of blocky color are one of the most attractive things about her books. They're definite enough to identify the different animals, but still have a unique, stylized look. Her style is especially suited to patterns, like stripes! It's hard to decide on a favorite picture; I love the elegantly arched tail of the cover skunk, but the intricate markings on the bongo and its steady stare as it stands on a peak in the moonlight are awesome as well. Then there's the adorable baby tapir, with his stripes and spots, the turkey with not only a beautifully striped and edged tail but also carefully detailed black and white striped wing feathers...they are ALL my favorites! I am generally not a fan of rhyming text, and honestly it's not going to win any awards for the beauty of the language, but the great strength of Stockdale's text is how perfectly it fits together with the illustrations, making a complete whole that has so many applications in storytime and just reading together, while still being an enjoyable, well-written book, that it's really a must for any library that serves small children. I am excited about using this book in storytime. This one has even more applications than her previous books. 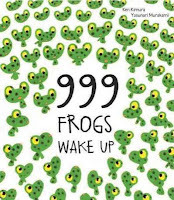 We often chant the rhymes aloud while turning the pages, something the kids starting doing spontaneously for me. We also guess at the types of animals, then look to see if we're right in the back. This book has so many geographical locations, that's another aspect to explore - are they on a mountain, in the jungle, under water? There's also discussion fodder in how the animals use their stripes, especially looking for the ones who use them for camouflage. Verdict: Preorder it now! I put it on my March order and will be using the F&G I received in displays to promote the book. I think this might be my new summer kindergarten outreach storytime book as well, much as we love Fabulous Fishes. An absolute must for your library. This is a new series called "Shock Zone, Deadly and Dangerous" and it definitely aims for the wacky/scary facts audience. 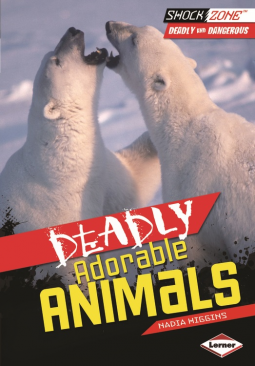 Each spread features an adorable animal on the left and its deadly skills on the right with lots of eye-popping freaky facts. The reader will learn about cute dolphins...and their serial killer behavior. Sweet little kittens...and the deadly diseases they spread. Some of the animals, like puffer fish and poison dart frogs, are ones kids will probably expect. Others, like giant otters and swans, are a bit different. There are lots of eye-catching photographs and splashy colored graphics. 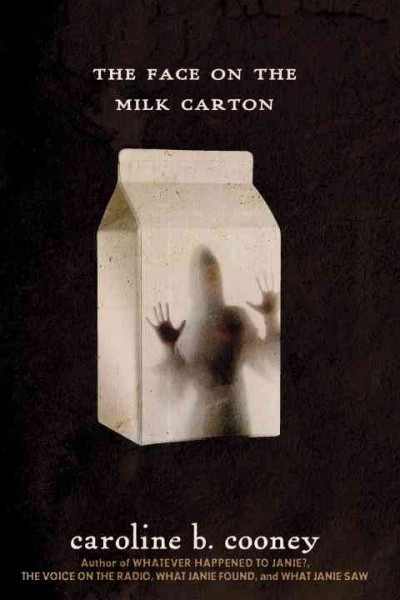 Reluctant readers will scoop this one up, as will most kids who like facts, especially scary or gross ones. There are additional websites and books to peruse and a brief index. 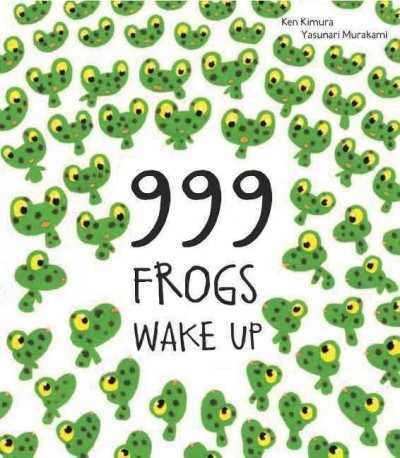 Verdict: This is one of those books that kids will gobble up, but is it worth it? It's a very short title - only 36 pages. It's definitely not worth $20 for a library bound volume, but a paperback might easily vanish on the shelf. I will probably buy this and a few others from the series in paperback, but I think they'd make better summer reading prizes or browsing collection books. This is the same thing I did for Cybils finalists last week. I will say having people to sit with during the awards makes it lots more fun but after all the screaming and whooping and clapping and disco lights are over, what is already on my shelves and what will I add? For, I think the first time ever, I own all the Caldecott honors and winner. It was a very populist list this year! I usually buy all or most of them anyways, unless there's a poetry book. This is a little more dicey. I always buy the winner, but not necessarily the honors. Personally, I think that no new books about gorillas need to be written after L. M. Boston's Stranger at Green Knowe. However, I guessed that this would win something and put it on my order list for February - and I was right. I can't even get Night Fairy to circ and I have fairy fans! Pass on this one. 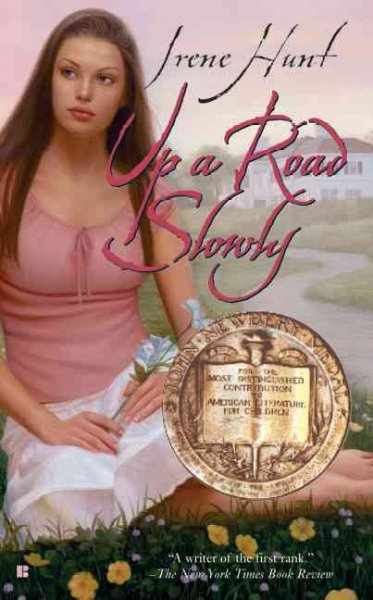 ehhhh, I looked at this one but it's Southern quirky and...no. Unless somebody specifically asks for it. Sometimes I buy them, sometimes I don't. I didn't think I'd heard of this, but then we went to the Bloomsbury booth afterwards and she described it to me and I thought "ohhhh yeah, I remember reading the reviews about this." I didn't buy it because it did not sound like something the teens would pick up off the shelf. I am not the only person in my consortium who felt this way - only two high school libraries and three public libraries own it. I don't feel the need to buy it because there are copies available and probably others will buy it now that it's won an award. Uh...no. The cover kills it. I don't know what the book is about and it doesn't matter. The cover is never going to let it off the shelf. I buy them! Sometimes they choose picture books, which kinda throws me (do I move them to easy reader?) but usually I already own them all. I usually buy all of these, the nonfiction they choose tends to be things that will circulate. And then they go and pick a picture book biography. 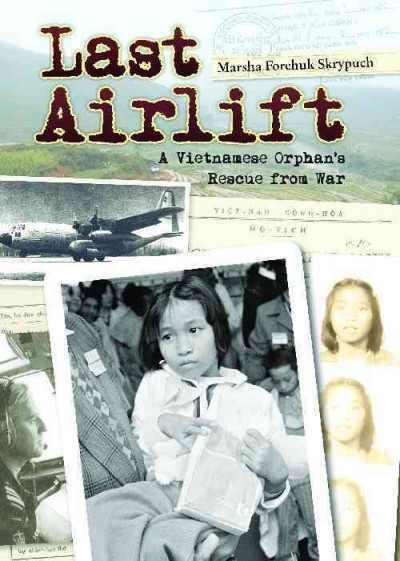 Some of the nonfiction picture book Cybils panelists really liked this one and the cover is certainly a grabber, but pic bios just will not circ. I had already decided to buy this from Cybils. Sometimes these circ, sometimes they don't. I have the same problems with these as the Coretta Scot King awards - too many of them are genres that don't circulate well. I don't, by the way, mean that I think they should pick more popular books or whatever - I don't really care. I'm lucky enough to be in a big consortium so if I don't get one, several other people will (there are some areas with more diverse populations or their communities like to read different things) I just will choose not to buy them because they don't circulate well. This sounded a bit too literary for my teens, but the cover isn't bad and it's won enough different awards and honors that I will go ahead and purchase it. I will wait until April and get the paperback though. No more picture book biographies. Pass. These awards generally don't do well at our library. I am really reluctant to buy high concept picture books, any additional books on civil rights, or picture book biographies as all of them have poor circulation. I have decided not to purchase this one. Double whammy of poetry and high concept. Looked at it, but it won't circulate here. Too urban, too basketball, too old an audience to understand what's going on. Too old for my picture book audiences. It won't circ - would probably do well in a school library. I went back and forth on this one - I will go ahead and buy it. This one I will purchase. I looked on Amazon and the print doesn't look too small. I don't know how well it will circulate - biographies tend to only go out if they're about one person and 100 pages long, but this one sounds interesting. I had some serious reservations about this book and it's really too long for a picture book, but I do think people would read it, so I will go ahead and purchase it. I read this and enjoyed it, but it won't circulate in our teen collection. Didn't purchase. After looking at last year's circulation statistics, I have decided that the teens are not getting any more audiobooks and the kids are only getting audio books on playaway and mp3 cd. Purchased the book, will not buy the audio. I have some of these on audio, but their popularity has died down. I don't think I even bought the book. Pass. This sounds fun and it's available on playaway. Put it on my audio wish list. No more teen audiobooks for the foreseeable future. These are usually pretty popular titles, but as always I can only buy a limited number of teen books. Ehhhh, my teens really prefer lighter romances, more along the lines of Sarah Dessen. Pass. Went back and forth on this one, finally comes down to - I can't buy everything and this one isn't going to be bought. I'll almost always buy the younger of these, teen titles kinda depends. I debated buying this but ultimately wasn't impressed enough with the art. I will go ahead and get it, but probably not until March. I looked at this, but didn't buy it. I'll put it on the voting window and see if the teens are interested. We have quite a few GLBTQ books, especially for a small community. Personally, I feel that to have a more diverse and balanced collection we need more inspirational titles and books with a religious outlook (hence my stopping at Zondervan, where they gave me a nice stack of teen titles). I will buy some, especially if they are of the "great teen fiction where a character happens to be gay" variety. no, just don't have the budget to buy everything. I'll put this on our voting board to see if any teens are interested. Flux stuff is interesting, but the cover on this I don't think will go well. No. This sounds interesting, but the cover will kill it dead on the shelf. Did not purchase. Alex Awards: I was pleased to see My Friend Dahmer. We debated adding that to the adult collection and now that it has a shiny sticker it will be easier to defend. This week at the library; or, ALA Midwinter, snow, butterflies, and books! Coffee is basically Pattie having office hours in our storyroom, which I think is an AWESOME idea. People often want to talk to her and there's not time after storytime, plus it will bring more folks in to the library and children's area! It's true that people often think she works at the library, and sometimes won't come to programs if Miss Pattie isn't there, but I'm fine with that. We get to count the numbers and I have lots of people at my programs. I was smart this year and took an extra day after the conference, so our reference assistant, Linda, kindly agreed to do Preschool Interactive for me. I give to you...my book stacks! Because I can. The library book shelf. Mostly picture books and comics right now. My reading chair. I am currently re-reading Ngaio Marsh, but I'm almost done. Those are things I'm reading now, with a pile of comics on top of the box on the top shelf, and then...other stuff. Library books, galleys, review copies, etc. My desk, some library cds, some personal cds I haven't convinced the computer to download, random paperwork...and the pile of books that have been read, recorded on LibraryThing and are waiting for reviews. Bonus Picture: The view from my craft table (and reading chair). It's snowing! I am methodically working my way through as many of the Marvel rebooted first volumes, as possible. Just for fun and also to figure out which to buy for the teen and adult collections. I bought this one before I had read it, since the couple Fantastic Four collections we have do check out. I'm sure this one will, although it's a bit more adult angsty than teen adventure and blowing up bad guys, but personally I really hated it. I liked Ultimate Fantastic Four (not ALL of them, just the first couple volumes) and the only character in this reboot that made sense or that I liked was Johnny, which was weird because usually I find him kind of annoying. Reed is an egomaniac who purposely risks the lives of his friends and family to be the first into space, ahead of the official launch. He's a really unpleasant personality and one wonders exactly why Susan likes him. Until you realize that she apparently has no job or means of support, so I assume she's living off her sort-of-fiancee while doing lunch and shopping with her girlfriends and complaining about him. He spends a lot more time with his lab assistant, Alyssa, and it's never really clearly defined whether he's just totally clueless and selfish, or whether he was cheating on Sue, or just thinking about it. Or if he actually has a relationship with Susan outside of her own mind. The same problem with Ben as always - he's supposed to be this giant dumb lunk, but also...a crack airforce pilot? Johnny actually makes sense in this one - he loves cars and models on the side to pay for his cars. He is also a mechanic and enjoys what he does. These are supposed to be fresh starts for the characters so people not familiar with them can just pick up and start reading, but a huge portion of the story has Namor attacking Johnny because he thinks he's the...previous Human Torch? Who was somehow involved in the destruction of Atlantis and causing Namor to become a street guy? And Mole Man is good but misunderstood? I don't know where any of these storylines came from and found it confusing. There's an additional comic at the back, which I didn't really look at - all the characters were heavily-muscled and there were multiple Reeds and...yeah. The art is pretty basic, not so weird that it can't be followed, but it doesn't seem to have any particular style. That's fine by me - when I read a superhero comic I want to think about the action and characters and not the artistic ability of the creators. However, it was so generic that I didn't get any good feeling for the time period. No time maybe? The hairstyles, behavior, and language seem contemporary, Reed's competing with a shuttle launch for space tourism? And Ben Grimm and his friends in his childhood flashbacks wears a cap and seems to be in the 1920s. 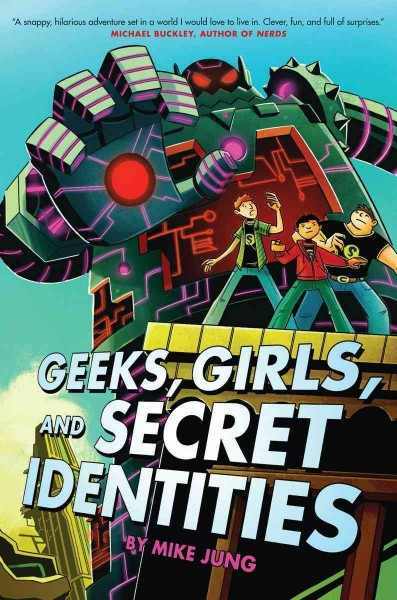 Verdict: This is rated T+ and although there aren't a lot of graphic situations (unless you count Sue's friends and Alyssa joking that they wouldn't date Reed because he feels like an "inflatable pool toy") it feels much more slanted toward an adult audience. The concerns and emotions of the characters are all adult and I particularly disliked how Sue and Reed's characters were presented. However, Fantastic Four is popular and I think it will circulate. If I had read it first I might have put it in the adult collection though.